Patio & Hearth wishes everyone a relaxing and fun Labor Day weekend, so we’ll leave you with something sweet. 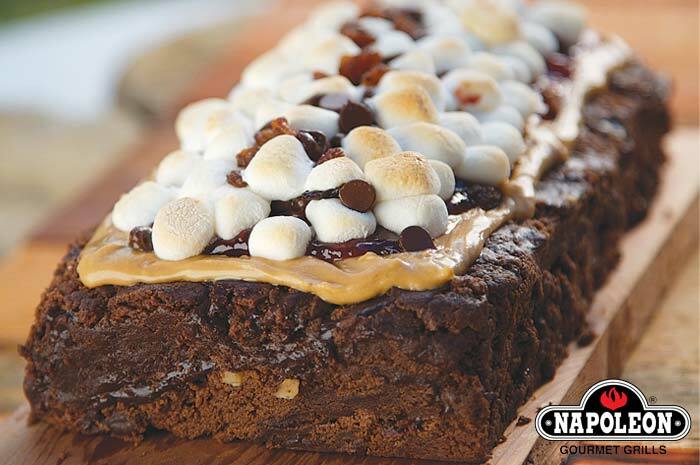 Napoleon Gourmet Grills’ recipe for Plank-Smoked Chocolate Chocolate Chocolate Brownies. In a heavy saucepan, melt butter and unsweetened chocolate over low heat, stirring occasionally. When melted, remove from the heat and let cool slightly. In a large mixing bowl, beat the 5 eggs, vanilla, 3½ cups sugar, and salt for 10 minutes at medium speed. Blend in the melted chocolate at low speed just until mixed (don’t over-beat). Gently stir in the 1 cup chocolate chips, white chocolate, and macadamia nuts. In a heavy saucepan, heat the cream and 1 cup chocolate chips, stirring constantly, until chocolate is melted and the mixture is smooth. Cool slightly. Beat the 3 eggs, 1⁄3 cup sugar, and salt until foamy, 4 to 6 minutes. Stir into the melted chocolate. Preheat the grill to medium or a touch higher (375°F/190°C). Pour the brownie mixture into the prepared pan and gently smooth to level. Spread the topping mixture over the brownie mix. Set the soaked plank on the grill and set the brownies on the plank. Close the grill lid and bake for 40 to 45 minutes. Cool for several hours or overnight before cutting into squares.